New York is a city full of skyscrapers. That’s why seeing the city from above becomes something so special. There are several ways you can enjoy the views of the city. One is through observatories. The city has three (Empire State, Top of the Rock and One World Observatory). Another tip is to check out one of the several rooftop bars in the city. Lastly, another idea is having lunch or dinner in a restaurant with a view. And today I’m going to list for you four restaurants with incredible views that are worth! 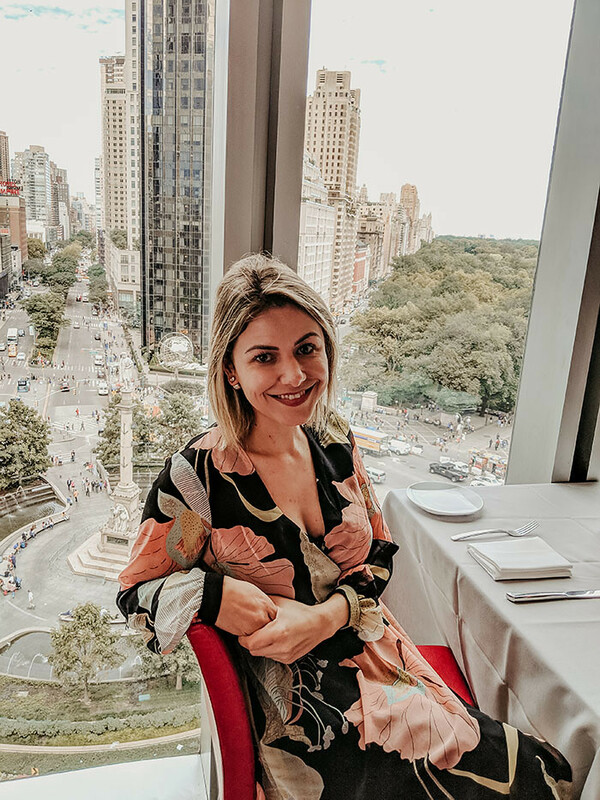 Asiate – it is located on the 35th floor of the Mandarin Oriental, a hotel located in Columbus Circle, a super charming area of the city, in an outstanding location, close to Central Park. You can imagine why this restaurant is so special, right? The view of the park, of course! The decor is beautiful and spotless. The restaurant has huge glass windows that, of course, reveal all the beauty of the southern part of Central Park, beyond the Columbus Circle area and 59th Street. Brunch (on weekends, from 11h45am to 2pm) – fixed price of $64. In this amount, it is included: an appetizer, a main course, and a dessert. Not included: drinks, taxes and gratuities. Breakfast (served every day from 7 a.m. to 10.30 a.m.) – they have egg dishes, which cost $25 on average, plus combos that include a plate + juice/ coffee/tea for $40 on average. Among the cheaper options, there are oats, granola, and avocado toast – prices from $15 to $30. 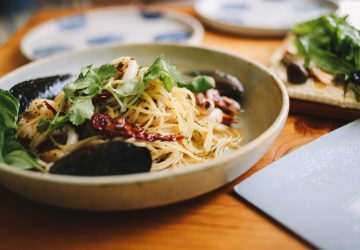 Lunch (served from Monday to Friday from 12 a.m. to 2 p.m., a la carte) – main courses range from $32 to $36 – fish, burger, etc. Dinner (served every day from 6:00 pm to 10:00 pm) – fixed price of $ 95, with appetizer, main course, and dessert. There is also a Chef’s Tasting Menu, with 6 courses for $ 150. If you were curious about the options for lunch, dinner, and breakfast, I suggest you click here and scroll to the bottom of the page to check out each of the menus. Robert -restaurant focused on American cuisine and open for lunch, dinner, and brunch. It is located on the ninth floor of the Museum of Arts and Design, in Columbus Circle. Its view overlooks the Columbus Circle area and also Central Park.In addition, the decor has a very modern footprint, with purple chairs. It’s worth remembering that you do not have to buy a ticket for the museum to go to the restaurant – just walk up the elevator to the ninth floor. The lunch menu (Monday through Friday) offers options starting at $18. In the evening, at dinner, the options start at $23. I suggest clicking here and check all the menus. Click here and check out my post with more pictures. 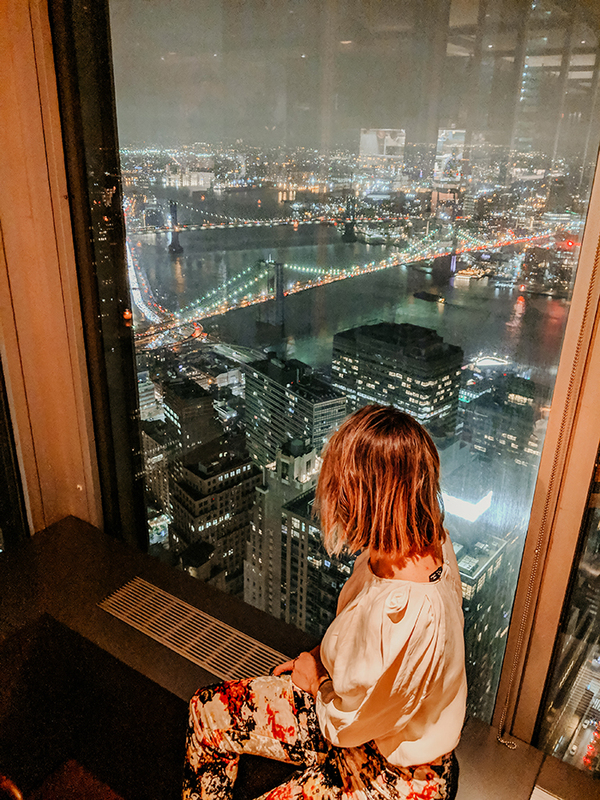 The View – This is a restaurant that sits on the 47th floor of the New York Marriott Marquis, in the heart of Times Square. For the location, on top of a building, you can imagine that one of the highlights of the place is due to the view, right? In addition, it has a very special detail: no matter the location of your table, you will see the whole view, since it is a revolving restaurant. On Sundays only, The View offers brunch from 10 am to 1.30 pm. The buffet features three stations. One with assorted bread, bagels, and cakes – all baked there – salads and also cheeses, salami, ham. The other station – and the largest one – features hot food. There are pasta, salmon, chicken and vegetables, plus the typical American brunch options such as bacon, eggs, potatoes and waffles. At the same station, you can order an omelet and pancakes, freshly prepared, and your way. The last station is the desserts one, with a varied range of cheesecake and other delights, plus a chocolate fountain, to make your own fondue (there are fruit and marshmallows for that). There is coffee and juice and the brunch even includes two Mimosas per person. All this for the price of $65 per person (not including taxes and tips). You can click here and check all the options of the buffet. Another thing worth mentioning is the Lounge, which is on the next floor, 48th and is a bar. If your idea is to enjoy the view, it may be a good option. The Lounge requires a minimum of one drink per person and from 8 pm they charge a fee of $8 per person. Click here and check out my post with more pictures! 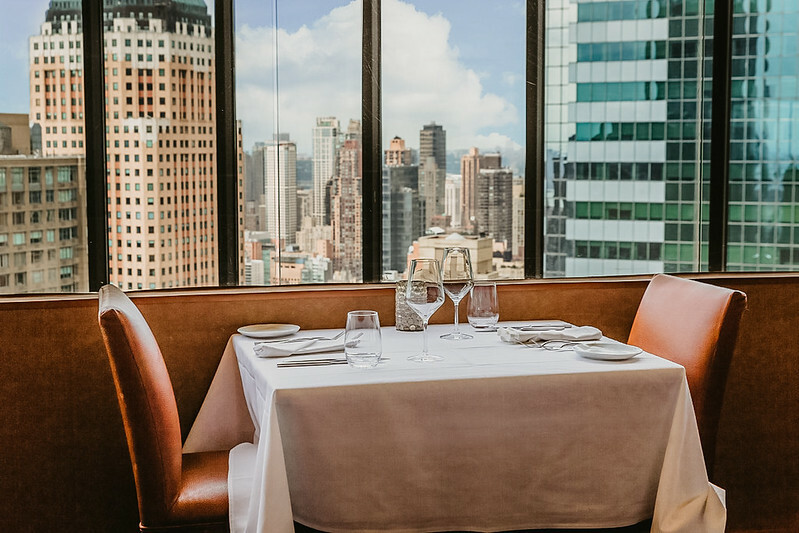 Manhatta – this restaurant, which belongs to the Union Square Hospitality Group, combines sensational views with a menu from chef Jason Pfeifer, offering seasonal options inspired by French flavors. Manhatta is located on the 60th floor of a building located in Downtown, on Liberty Street. 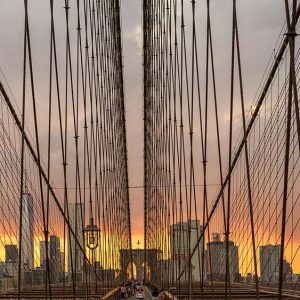 Its prime location on a high floor and its expansive windows provide a breathtaking view of the city, overlooking the east, west and midtown – for you to have an idea, you can spot the Empire State, Brooklyn Bridge and Manhattan Bridge. The view is very similar to that from the One World Observatory – the only difference is that Manhatta does not have a southern view.